Can someone explain to me why the Patriots should jump at the chance to trade Jimmy Garoppolo if the compensation is just one first round pick? When you evaluate the lopsided trades that were made yesterday during the NFL draft for QB’s that haven’t played a down or haven’t been in a successful, winning system like New England, Garoppolo’s price tag should be higher than ever. Texans move up 13 spots to draft a QB for a2018 first round pick. Chiefs move up 17 spots and send a first and third round pick to the Bills. Bears channel their inner Herschel Walker and give up two third round picks and a fourth-round pick to move up one spot. The Patriots should be patient as they are in the driver’s seat. Yes they risk losing Garoppolo without compensation after this season, but they also cover themselves if Brady gets hurt, if Brady significantly declines or if a team gets incredibly desperate during training camp. Thank you Xander Bogaerts. He finally addressed the elephant in the room after another embarrassing offensive effort by the Red Sox, who scored one combined run in two games against the Yankees including being shutout for the third time. No more David Ortiz. We all feared this would be a problem, but underestimated the intangibles Ortiz brought like leadership and how he took the pressure off everybody else. Sox GM Dave Dombrowski was counting on a healthy Pablo Sandoval https://www.youtube.com/watch?v=QFANsGlWpmY and free agent Mitch Moreland to lift the offense and replace Ortiz’s production. Ask Chris (I have received four runs of support in my five starts) Sale how he feels about that. On top of that, reigning Cy Young Rick Porcello has had one quality start out of five, Steven Wright has been awful and the leader of this listless ship John Farrell gives new meaning to uninspiring. Meanwhile, the young and upstart New York Yankees minus an injured Gary Sanchez are 12-3 in their last 15 and look very strong. Pessimistic fans and scribes will tell you that Jacoby Ellsbury will eventually get hurt, C.C. Sabathia will have too much to eat and their young guns will be inconsistent, but I disagree. Their bullpen is tremendous even aside from Dellin Betances and Aroldis Chapman. Masahiro Tanaka is 10-1 in his last 11 decisions, looked dominant against Boston and is long past the injury issues he dealt with in 2015. Luis Severino was mentored by Pedro Martinez and he has been dominant while the hitting is solid but unspectacular. By the way Aaron Judge reminds me of Dave Winfield in stature. Did you know Craig Kimbrel is 22-for-22 in save opportunities at Fenway Park? 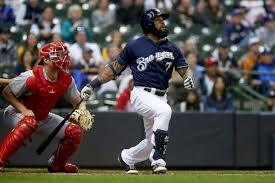 I love Milwaukee Brewers first baseman Eric Thames. He leads the majors in home runs with 12 and had been playing in the Korean League for the last four years. And here come the steroids accusations! There is no better response than his own after he has already taken two voluntary tests this month. Be rooting for a Pittsburgh-Edmonton Stanley Cup to see Sidney Crosby against Connor McDavid. McDavid is more than special. He is soon to be the Mike Trout of the NHL and is the heir apparent to Crosby. The difference is, he is likable and not a crybaby. I wonder what is going through the mind of P.K Subban as he helps his playoff-undefeated Nashville Predators win their first Stanley Cup while Claude Julien and the Montreal Canadiens are well…on vacation. So are the Toronto Raptors truly ready to dethrone that Cleveland Cavaliers? They have made it the second round twice and the Eastern Conference Finals last year only to lose in six to the LeBron’s. But this time is different. Trade deadline acquisitions Serge Ibaka and P.J. Tucker, a healthy Kyle Lowry could be the difference? I say no. Raptors take Cavs to seven games and lose. For all the good things Doc Rivers did with the Celtics, he has been an abject failure with the Clippers. His teams have lost twice in the second round and are about to lose in the first round in back-to-back seasons. He and his players have continuously underachieved and Chris Paul is still without a championship. I am officially on the Milwaukee Bucks bandwagon and am jumping on now after they lost to Toronto so it looks like I am not attaching myself to a winner. Thon Maker or Breaker. Chris Berman eat your heart out!